en su hábitat natural, en la zona Habana-Matanzas, sobre fondo rocoso, Cuba. Foto: Ángel Fernández. Cabo de Palos, Murcia, Spain. 21 Jul 2014. Isabel Rubio Perez. © marmenormarmayor.es. Cabo de Palos, Murcia, Spain. 21 Jul 2014. Isabel Rubio Perez " . © marmenormarmayor.es. Morphological complex plant of ecad uvifera and ecad lamourouxii. Palau Islands, West Pacific. Hideo Ohba. © Palau International Coral Reef Center. Ecad uvifera. Palau Islands, West Pacific. Hideo Ohba. © Palau International Coral Reef Center. Ecad uvifera. Palau Islands, West Pacific, 2 m deep in the sun. Hideki Yukihira. © Palau International Coral Reef Center. Ecad uvifera. Palau Islands, West Pacific, 1 m deep in the sun. 29 Oct 1995. Hideo Ohba. © Palau International Coral Reef Center. Ecad lamourouxii. Palau Islands, West Pacific. Hideo Ohba. © Palau International Coral Reef Center. Ecad lamourouxii. Palau Islands, West Pacific, 0.5 m deep, shady place. Hideo Ohba. © Palau International Coral Reef Center. Ecad lamourouxii. Palau Islands, West Pacific, 4 m deep. Hideki Yukihira. © Palau International Coral Reef Center. Type locality: Suez, Egypt (Silva, Basson & Moe 1996: 832). Type: Herb. Forsskal, C 845 (Belton et al. 2014: 50). Notes: Leg. P. Forsskål (Lipkin & Silva 2002: 65). Børgesen (1940) cites this species as Caulerpa racemosa (Forsskål) Weber van Bosse. John et al. (2004) cite Caulerpa racemosa (Forssk) J. Agardh var. peltata (J.V. Lamour.) Eubank, Caulerpa peltata J.V. Lamour, Caulerpa occidentalis (J. Agardh) Jaasund and Caulerpa lamourouxii C. agardh as synonyms of this species. One of the three varieties occurring in the Mediterranean has invasive characteristics and has become aggressively widespread throughout the Mediterranean basin since the early 1990s; Piazzi et al. (2001) provided experimental evidence of its deleterious effects on macroalgal diversity on local scale. Verlaque et al. (2003), on the basis of molecular data, confirmed that this invasion is the result of a recent introduction and identified the invasive variety as C. racemosa var. cylindracea (Sonder) Verlaque, Huisman & Boudouresque. Hawaiian: limu fuafua (Chapman & Chapman 1980).
? : Lelato, Ararucip, Tahmuck (Madlener 1977), Lelatu, Limu Eka (Arasaki & Arasaki 1983). English: Sea Grapes, Mouse plant (Madlener 1977). Ilocano: Ar-arucep (Lembi & Waaland 1988). Tagalog: Lato (Lembi & Waaland 1988). Tahitian: Rimu (Lembi & Waaland 1988). Indonesian: Lai lai (Chapman & Chapman 1980). Nuber, N., Gornik, O., Lauc, G., Bauer, N., Zuljevic, A., Papes, D. & Zoldos, V. (2007). Genetic evidence for the identity of Caulerpa racemosa (Forsskal) J. Agardh (Caulerpales, Chlorophyta) in the Adriatic Sea. European Journal of Phycology 42: 113-120. Sauvage, T., Payri, C., Draisma, S.G.A., Prud'homme van Reine, W.F., Verbruggen, H., Belton, G.S., Gurgel, F.D., Gabriel, D., Sherwood, A.R. & Fredericq, S. (2013). 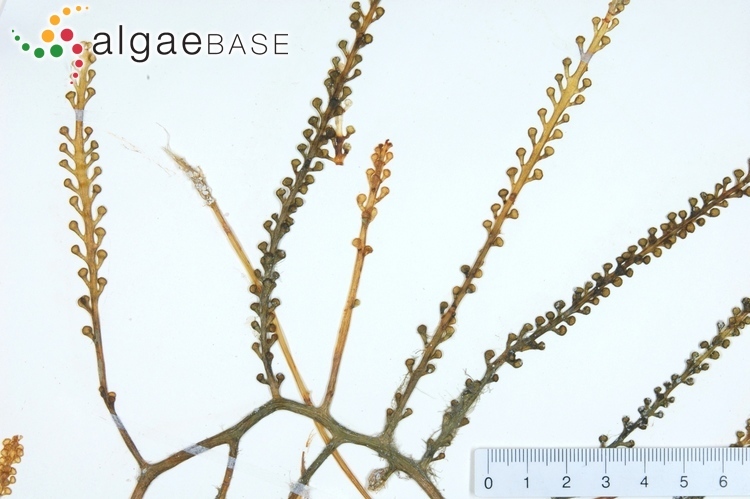 Molecular diversity of the Caulerpa racemosa-Caulerpa peltata complex (Caulerpaceae, Bryopsidales) in New Caledonia, with new Australasian records for C. racemosa var. cylindracea. Phycologia 52(1): 6-13. Accesses: This record has been accessed by users 37812 times since it was created. Aleem, A.A. (1992). Caulerpa racemosa (Chlorophyta) on the Mediterranean coast of Egypt. Phycologia 31: 205-206. Alongi, G., Cormaci, M., Furnari, G. & Giaccone, G. (1993). Prima segnalazione di Caulerpa racemosa (Chlorophyceae, Caulerpales) per le coste italiane. Boll. Acc. Gioenia Sci. Nat. 26(342): 49-53. Bachir Bouiadjra, B., Belbachir, N., Youcef Benkada, M., Maarouf, A. & Riadi, H. (2010). Sur la presence de l'algue marine Caulerpa racemosa (Forsskal) J. Agardh (Caulerpales, Chlorophyta) devant la côte Mostaganemoise (Ouest Algerie). Acta Botanica Malacitana 35: 168-171. Ballesteros, E., Grau, A.M. & Riera, F. (1999). Caulerpa racemosa (Forsskål) J. Agardh (Caulerpales, Chlorophyta) a Mallorca. Boll. Soc. Hist. Nat. Balears 42: 63-68. Bernardeau Esteller, J. & Martínez Garrido, J. (2010). Caulerpa racemosa var. cylindracea en el Mediterraneo: Estudios en la Región de Murcia. ALGAS. Boletín de Sociedad Española de Ficología 43: 19-26, 6 Fig. Bernardeau-Esteller, J., Marín-Guirao, L., Sandoval-Gil, J.-M. & Ruiz, J.M. (2011). Photosynthesis and daily metabolic carbon balance of the invasive Caulerpa racemosa var. cylindracea (Chlorophyta, Caulerpales) along a depth gradient. Scientia Marina 75: 803-810. Blazina, M., Ivesa, L. & Najdek, M. (2009). Caulerpa racemosa: adaptive varieties studied by fatty acid composition (Northern Adriatic Sea, Vrsar, Croatia). European Journal of Phycology 44(2): 183-189, 4 figs, 1 table. Box, A., Sureda, A., Tauler, P., Terrados, J., Marba, N., Pons, A. & Deudero, S. (2010). Seasonality of caulerpenyne content in native Caulerpa prolifera and invasive C. taxifolia and C. racemosa var. cylindraceae in western Mediterranean Sea. Botanica Marina 53(4): 367-375. Buia, M.C., Petrocelli, A. & Saracino, O.D. (1998). 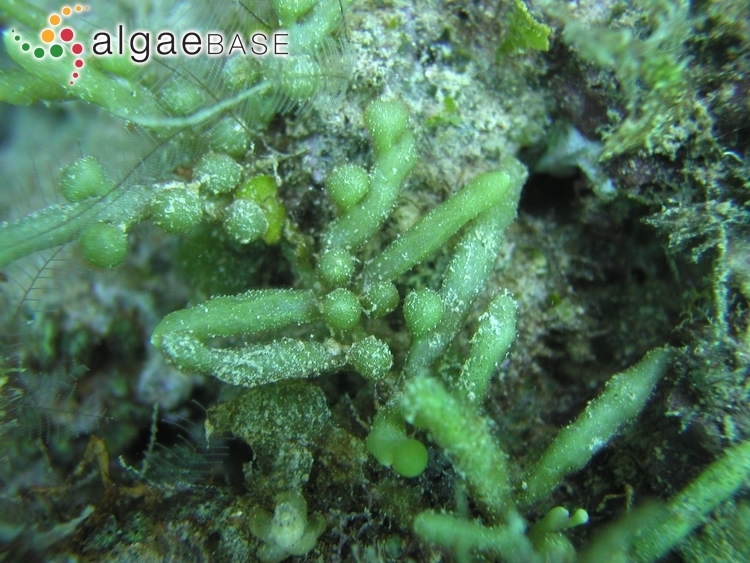 Caulerpa racemosa spread in the Mediterranean Sea: first record in the Gulf of Taranto. Biologia Marina Mediterranea 52: 527-529. Capiomont, A., Breugnot, E., den Haan, M. & Meinesz, A. (2005). Phenology of a deep-water population of Caulerpa racemosa var. cylindracea in the northwestern Mediterranean Sea. Botanica Marina 48: 80-83. Capiomont, A., Breunot, E., den Hanne, M. & Meinesz, A. (2005). Phenology of a deepwater population of Caulerpa racemosa var. cylindracea in the northwestern Mediterranean See. Botanica Marina 48: 80-83. Ceccherelli, G. & Campo, D. (2002). Different effects of Caulerpa racemosa on two co-occurring seagrasses in the Mediterranean. Botanica Marina 45: 71-76. Ceccherelli, G. & Piazzi, L. (2005). Exploring the success of manual eradication of Caulerpa racemosa var. cylindracea (Caulerpales, Chlorophyta): the effect of habitat. Cryptogamie 26: 319-328. Ceccherelli, G., Cinelli, F. & L. Piazzi (2000). Response of the nonindigennous Caulerpa racemosa (Forsskal) J. Agardh to the native seagrass Posidonia oceanica (L) Delile: effect of density of shoots and orientation of edges of meadows. Journal of Experimental Marine Biology and Ecology 243: 227-240. Ceccherelli, G., Cinelli, F. & L. Piazzi (2001). 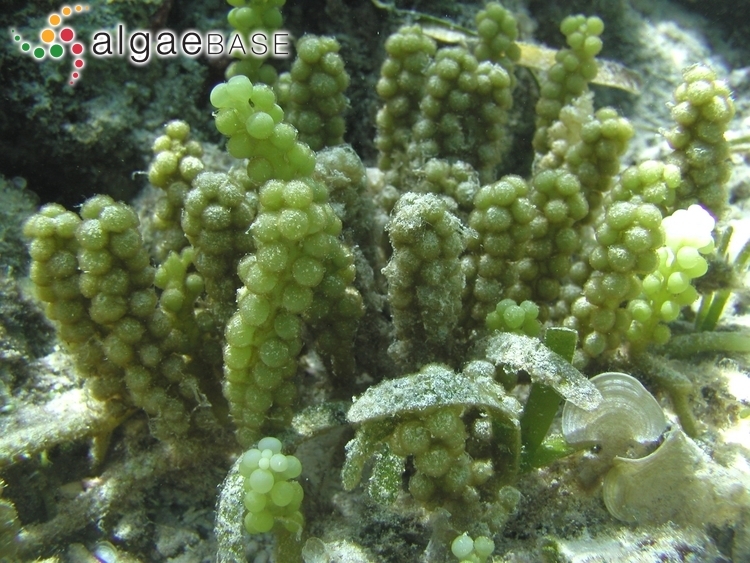 The development of Caulerpa racemosa at the margin of Posidonia oceanica. Fourth International Workshop on Caulerpa taxifolia : edit., GIS Posidonie publ., fr. : 376-384. Chauhan, V.D. & Thivy, F. (1965). On a new form of Caulerpa racemosa from Gujarat, India. Phykos 4: 10-11, 9 figs. Cirik, S. & Öztürk, B. (1991). Notes sur la présence d'une forme rare du Caulerpa racemosa, en Méditerranée orientale.. Flora Mediterranea 1: 217-219. Crawford, G. H. & Richardson, W. N. (1972). 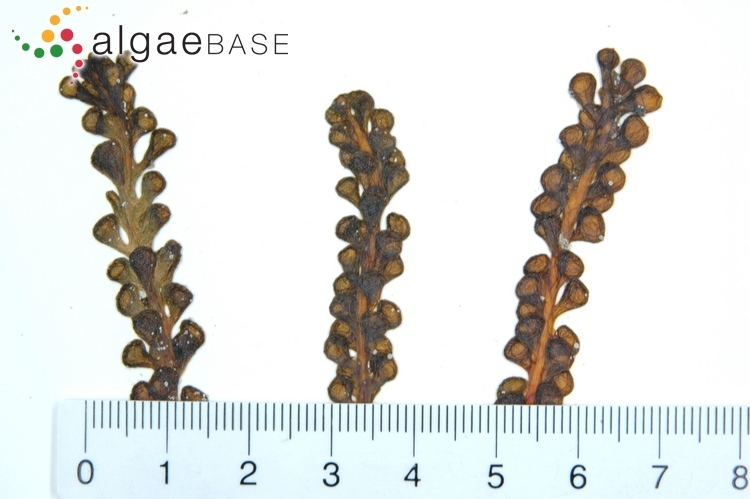 Heterotrophic potential of the macroscopic alga Caulerpa racemosa. Proceedings of the International Seaweed Symposium 7: 262. Durand, C., Manuel, M., Boudouresque C.F., Meinesz A., Verlaque M. & Le Parco Y. (2002). Molecular data suggest a hybrid origin for the invasive Caulerpa racemosa (Caulerpales, Chlorophyta) in the Mediterranean Sea. Journal of Evolutionary Biology 15: 122-133. Enguix, A.M., Argente, J., Chicharro, J., Ferrer, Z. & Castañer, V. (2013). Seguimento de la dispersión de Caulerpa racemosa var. cylindracea en espacios naturales protegidos marinos de la Comunidad Valenciana. Algas. Boletín de Sociedad Española de Ficología 47: 8-13. Enomoto, S. & Ohba, H. (1987). Culture studies on Caulerpa (Caulerpales, Chlorophyceae) I. Reproduction and development of C. racemosa var. laetevirens. Japanese Journal of Phycology 35: 167-177. Famà, P., Olsen, J.L., Stam, W.T. & Procaccini, G. (2000). High levels of intra- and inter-individual polymorphism in the rDNA ITS1 of Caulerpa racemosa (Chlorophyta. European Journal of Phycology 35: 349-356. Flagella, M.M., Lorenti, M. & Buia, M.C. (2008). Temperature response in a shallow-water Mediterranean population of Caulerpa racemosa var. cylindracea (Caulerpales, Chlorophyta), and a possible strategy of season anticipation. Botanica Marina 51(4): 278-277. Giaccone, G. & Di Martino, V. (1996). La vegetazione a Caulerpa racemosa (Forsskal) J. Agardh nella Baia di S. Panagia (Sicilia Sud-Orientale). Boll. Acc. Gioenia Sci. Nat. Catania 28: 59-73. Guillén, J.E., Jiménez, S., Martínez, J., Triviño, A., Múgica, J., Argilés, J. & Bueno, M. (2010). 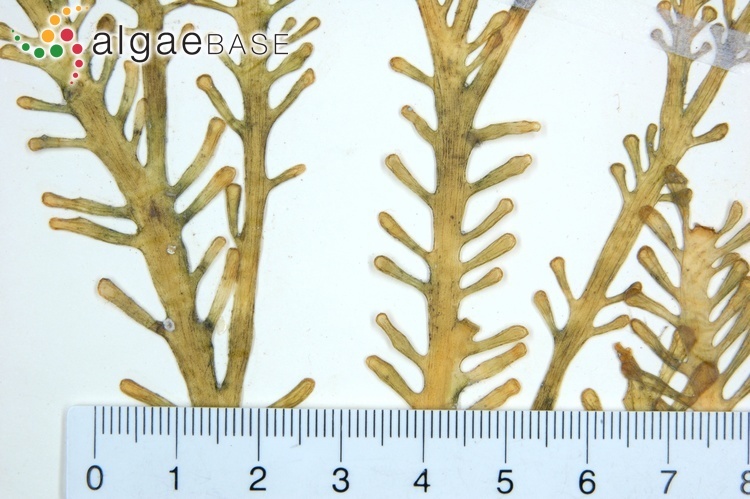 Expansion of the invasive algae Caulerpa racemosa var. cylindracea (Sonder) Verlaque, Huisman & Boudouresque 2003 on the region of Valencia seabed. Thalassas 26: 135-149. Huvá, H. (1957). Sur une variété nouvelle pour la méditeranée du Caulerpa racemosa (Forssk.) Agardh. Rec. Trav. Station mar. d'Endoume 12: 67-73. Klein, J. & M. Verlaque (2008). The Caulerpa racemosa invasion: a critical review. Marine Pollution Bulletin 56: 205-225. Klein, J. (2007). Impact de Caulerpa racemosa var. cylindracea (Caulerpales, Chlorophyta) sur les communautés macrophytiques en Méditerranée nord-occidentale. : Thèse de Doctorat, Université Aix-Marseille II, France. 315 pp. Lipkin, Y. & Friedmann, I. (1967). Persistent juvenile stage of Caulerpa racemosa (Forskål) Agardh in the eastern Mediterranean. Pubblicazioni della Stazione Zoologica di Napoli 35: 243-249. Mezgui, Y., Djellouli, A.S. & Benchick Almi (2007). Etude biométrique (Biomasse et phénologie) des populations à Caulerpa racemosa dans la Région de Bizerte (Tunisie). In: United Nations Environment Programme (Ed. ), Proceedings of the 3rd Mediterranean Symposium on Marine Vegetation, Marseille, France, 27-29 March 2007. Regional Activity Centre for Specially Protected Areas. 111-116 Tunis, Tunisia. Moreira-Reyes, A. & Gil-Rodríguez, M.C. (2008). Variaciones espaciales y temporales de Caulerpa racemosa var. cylindracea (Chlorophycota) en Los Cristianos e Igueste de San Andrés, Tenerife, Islas Canarias. Vieraea 36: 91-102. Ohba, H. & Enomoto, S. (1987). Culture studies on Caulerpa (Caulerpales, Chlorophyceae). II. Morphological variation of C. racemosa var. leatevirens under various culture conditions. Japanese Journal of Phycology 35: 178-188. Ohba, H., Nashima, H. & Enomoto, S. (1992). Culture studies on Caulerpa (Caulerpales, Chlorophyceae) III. Reproduction, development and morphological variation of laboratory-cultured C. racemosa var. peltata. Botanical Magazine, Tokyo 105: 589-600, 27 figs. Ould-Ahmed, N. & A. Meinesz (2007). 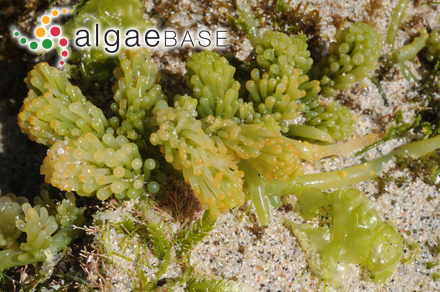 First record of the invasive alga Caulerpa racemosa (Caulerpales, Chlorophyta) on the coast of Algeria. Cryptogamie Algologie 28(3): 303-305. Pena Martín, C., Cristóbal Fernanz, J. C., Crespo, B. & Sánchez, M. (2003). 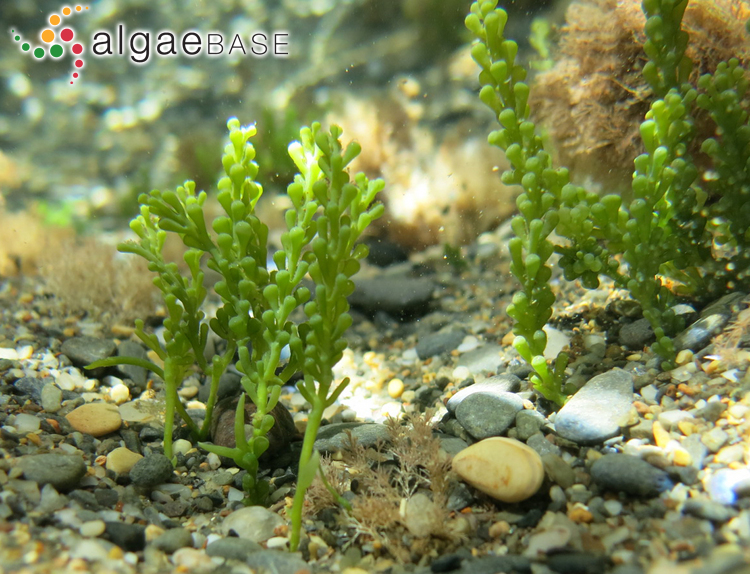 Caulerpa racemosa (Forssk.) J. Agardh (Caulerpaceae, Chlorophyceae), nueva para la flora de Alicante. Anales Jardín Botánico de Madrid 60: 448-449. Piazzi, L. & Ceccherelli, G. (2006). 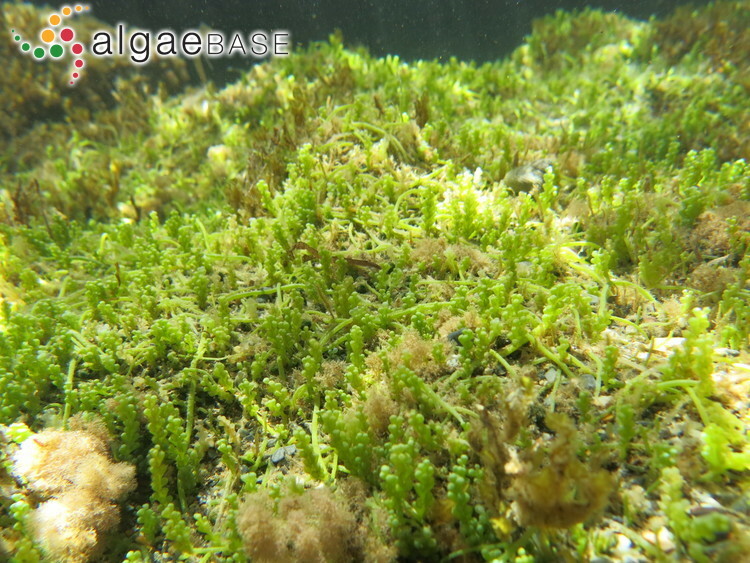 Persistence of biological invasion effects: Recovery of macroalgal assemblages after removal of Caulerpa racemosa var. cylindracea. Estuarine, Coastal and Shelf Science 68: 455-461. Piazzi, L., Balestri, E. & Cinelli 1994 (1994). Presence of Caulerpa racemosa in the northwestern Mediterranean. Cryptogamie, Algologie 15: 183-189. Piazzi, L., Balestri, E. & Cinelli, F. (1994). Presence of Caulerpa racemosa in the north-western Mediterranean. Cryptogamie, Algologie 15: 183-189, 4 figs. Piazzi, L., Balestri, E., Magri, M. & Cinelli, F. (1997). Expansion de l'algue tropicale Caulerpa racemosa (Forsskal) J. Agardh (Bryopsidophyceae, Chlorophyta) le long de la côte Toscane (Italie). Cryptogamie, Algologie 18(4): 343-350. Piazzi, L., Ceccherelli, G. & Cinelli, F. (2001). Threat to macroalgal diversity: effects of the introduced green alga Caulerpa racemosa in the Mediterranean. Marine Ecology Progress Series 210: 149-159. Piazzi, L., Meinesz, A., Verlaque, M., Açali, B., Antolic, B., Argyrou, M., Baltana, D., Ballesteros, E., Calvo, S., Cinelli, F., Cirik, S., Cossu, A., d'Archino, R., Djellouli, A.S., Javel, F., Lanfranco, E., Mifsud, C., Pala, D., Panayotidis, P., Peirano, A., Pergent, G., Petrocelli, A., Ruitton, S., Zuljevic, A. & Ceccherelli, G. (2005). Invasion of Caulerpa racemosa var. 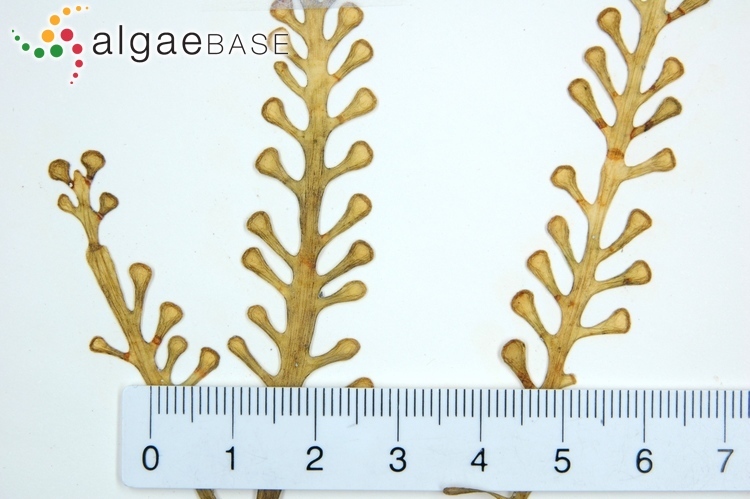 cylindracea (Caulerpales, Chlorophyta) in the Mediterranean Sea: an assessment of the spread. Cryptogamie, Algologie 26: 189-202. Rehm, A.E. & Almodovar, L.R. (1971). The zonation of Caulerpa racemosa (Forsskal) J. Agardh at La Parguerra, Puerto Rico. Revue Algologique, Nouvelle Serie 2: 143-151. Renoncourt, L. & Meinesz, A. (2002). Formation of propagules on an invasive strain of Caulerpa racemosa (Chlorophyta) in the Mediterranean Sea (Research Note). Phycologia 41: 533-535. Ruiz Fernández, J.M., Ramos Segura, A. & García Muñoz, R. (2007). 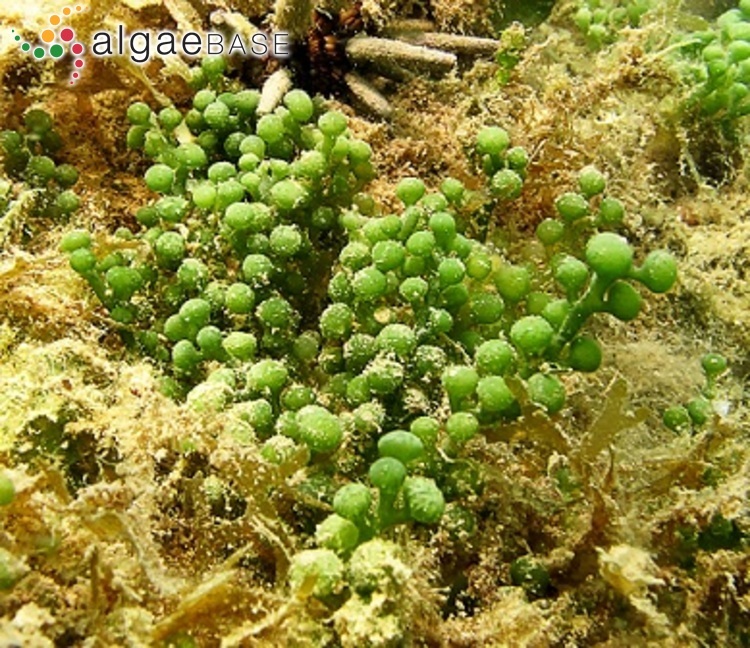 Aparición y propagación del alga tropical Caulerpa racemosa en el litoral de la región de Murcia. IEO: revista Inst. Español Oceanogr. 8: 29-34. Ruíz, J.M., Martín-Guirao, L., Bernardeau-Esteller, J., Ramos-Segura, A., García-Muñoz, R. & Sandoval-Gil, J.M. (2011). Spread of the invasive alga Caulerpa racemosa var. cylindracea (Caulerpales, Chlorophyta) along the Mediterranean coast of the Murcia Region (SE Spain). Animal. Biodiv. & Conserv. 34: 73-82. Sotto, F. (1978). The culture of Caulerpa racemosa in Kalawisan, Mactan Island, Cebu, Philippines: a potential for the seaweed industry. Philippine Scientist, University of San Carlos 15: 109-111. Vázquez-Luís, M.; Sánchez-Jerez, P. & Bayle-Sempere, J.T. (2010). Effects of Caulerpa racemosa var. cylindracea on prey availability: an experimental approach to predation of amphipods by Thalassoma pavo (Labridae). Hydrobiologia 654: 147-154. Verlaque, M., Afonso-Carillo, J., Gil-Rodríguez, M.C., Durand, C., Boudouresque, C.F. & Le Parco, Y. 2004 (2004). 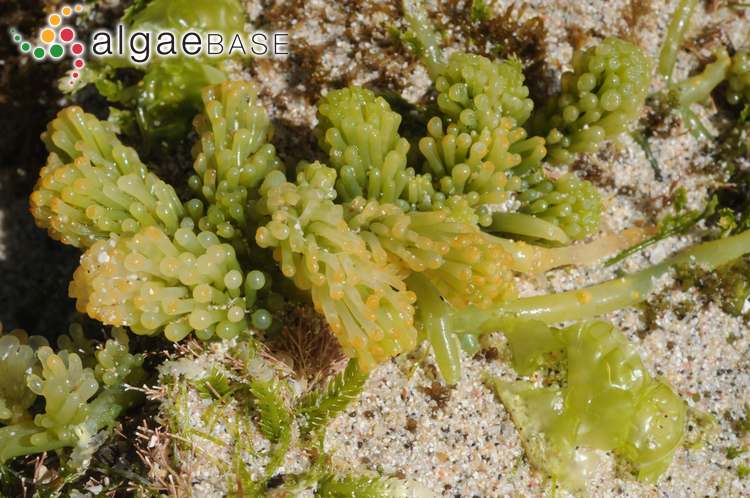 Blitzkrieg in a marine invasion: Caulerpa racemosa var. cylindracea (Bryopsidales, Chlorophyta) reaches the Canary Islands (north-east Atlantic). Biological Invasions 6: 269-281. Verlaque, M., Boudouresque, C.-F., Meinesz, A. & Gravez, V. (2000). 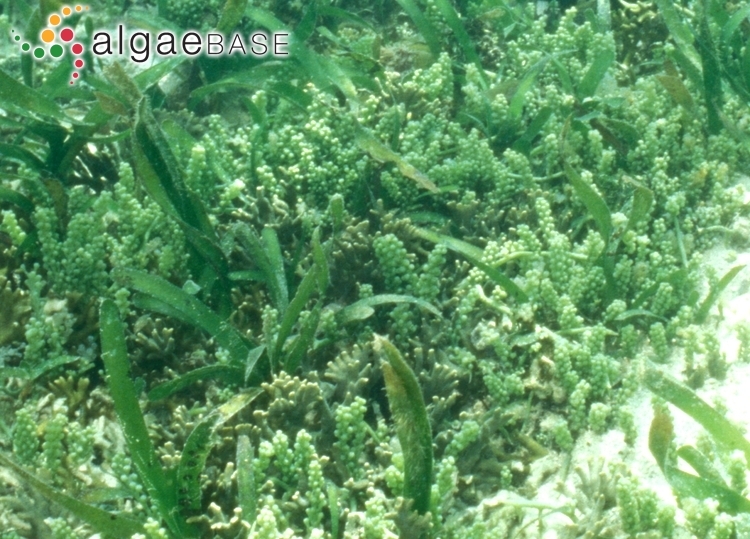 The Caulerpa racemosa complex (Caulerpales, Ulvophyceae) in the Mediterranean Sea. Botanica Marina 43: 49-68, 18 figs, 3 tables. Verlaque, M., Durand, C., Huisman, J.M., Boudouresque, C-F., & Le Parco, Y. (2003). On the identity and origin of the Mediterranean invasive Caulerpa racemosa (Caulerpales, Chlorophyta). European Journal of Phycology 38: 325-339. Wang, H., Li, Y.-L., Shen, W.-Z., Rui, W., Ma, X.-J. & Cen, Y.-Z. (2007). Antiviral activity of a sulfoquinovosyldiacylglycerol (SQDG) compound isolated from the green alga Caulerpa racemosa. Botanica Marina 50(3): 185-190. Zuljevic, A., Antolic, B., Nikolic, V., Despalatovic, M. & Cvitkovic, I. (2012). Absence of successful sexual reproduction of Caulerpa racemosa var. cylindracea in the Adriatic Sea. Phycologia 51(3): 283-286.